Less than 48 hours after launching my new eBook, The Ultimate Blog Profit Model, over 7,000 downloads have been registered. I really wasn’t expecting this much of a flood. Then again, the eBook is free and downloading it does enter you into a draw to win an Apple iPad. I guess I underestimated people’s desire for free stuff. I’ve received quite a few emails from readers asking me how to make an eBook. I wrote The Ultimate Blog Profit Model using Pages for Mac. 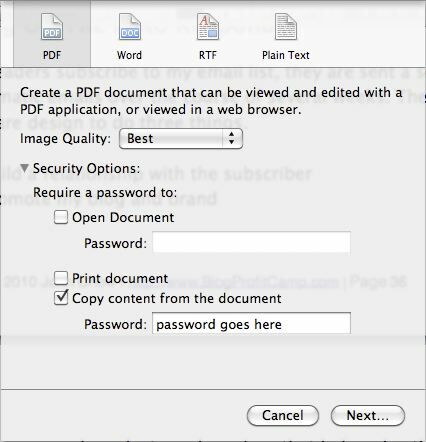 Pages has an export function that allows you to export the file as a PDF. It even features advanced options like password protecting the file (which I didn’t do) to preventing copy and paste (which I did do). If you’re a Windows users, MS Word has an add on that will allow you to export a Word document to PDF. To make sure everyone is able to download the eBook, I put it on Amazon S3 storage service. S3 is a cloud based storage solution that scales automatically to the demand and is extremely cost effective right now because Amazon is offering free data transfer until June 30. So those 7,000 downloads cost me nothing! I hope you’re all enjoying the book. I’ll be drawing the winner of the Apple iPad in the first week of July. Your chances of winning right now is 1 in 7,000 but I imagine it’ll be more like 1 in 30,000 by month end. Good luck!